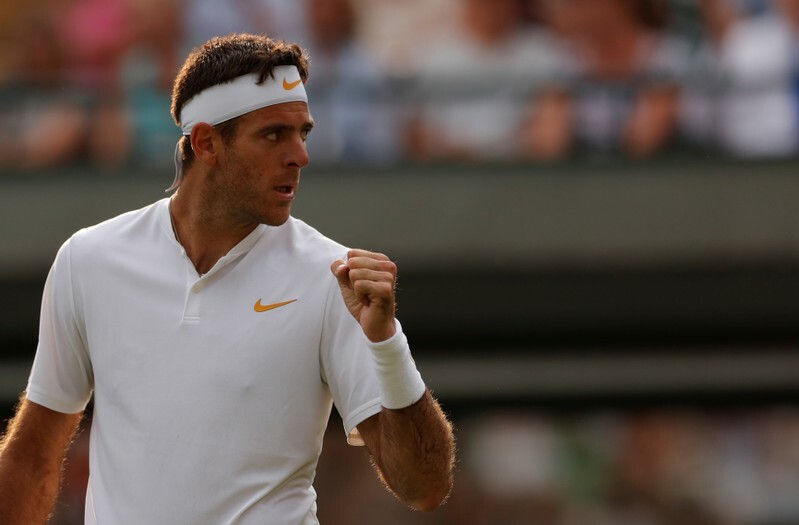 LONDON (Reuters) – Juan Martin del Potro showed he is shaping up nicely for tougher matches ahead with a 6-4 6-1 6-2 romp past Spanish veteran Feliciano Lopez to reach the third round at Wimbledon on Thursday. The big Argentine fifth seed, in the same half of the draw as world number one Rafael Nadal, was dominant throughout against the 36-year-old at his 66th consecutive Grand Slam tournament. Del Potro felt he had played a near perfect match, with only five unforced errors, and had been able to carry through his game plan thanks to getting early breaks in each set. “I soon made breaks in each set and on my serve I had no break points against. I played even better than I had expected,” said Del Potro as he looks for his first Grand Slam title since winning the U.S. Open nine years ago. Del Potro won in little over an hour, moving Lopez about the court and only occasionally coming under pressure from the Spaniard, who showed glimpses of deft net play but made 43 unforced errors. Asked if as a big server he had the game to upset holder and favorite Roger Federer, Del Potro said: “One’s service is very important on grass but it’s hard to beat Federer on grass, like it is with Rafa on clay. “But in these tournaments anything can happen, Cilic was one who could trouble them but he made a lot of mistakes and is out,” he added, referring to the third seed’s upset loss to his fellow Argentine Guido Pella earlier on Thursday. Del Potro faces Benoit Paire in the third round after the Frenchman upset 26th-seeded Canadian Denis Shapovalov. He is expecting a difficult match against a talented opponent who can be unpredictable, capable of playing equally well at the back as at the net. “Benoit can spring surprises, you don’t know what shots to expect from him, he’s very talented, so I’ll try to play better than today and I will have a big chance in the tournament if I beat Benoit,” he said.